First an attack by ruffians and now a storm. The quest for the Blue compass was not as easy as I thought. The small island which was chosen by our navigator had a history of being surrounded by storms. Only the toughest and the best of sailors could make it through. Firsty personally came out to man the sails. I grabbed the helm as strong winds and sheets of rain beat against me. The quarter master secured the lines on the central mast. Ah, we never felt so alive. The ship musician played some inspiring music which helped us brave the storm. The linguist was almost blown off board but he was expendable anyway. As the ship emerged from the storm, we saw an island. No, this wasn't our destination. It wasn't even on the charts. But upon observing it with me looking glass I found that it had a small village and a pizza place. Time to dock the ship me hearties!! There can be surprises in the strangest of places. What does one expect in Vile Parle East - the lackluster sibling of Vile Parle West? The area has no famous landmark to its name other than being somewhat close to the airport. Well, I may have just discovered a potential landmark mateys. Pizza Box is a small outlet fitting the quick serving restaurant archetype. A few tables inside and a few tables outside, the place is your typical local home delivery pizzeria. The place maybe small but move aside Dominoes, Pizza Hut, Smokin Joes and Garcia - Here comes Pizza Box. First things first, the grub here is adapted to Indian palates. If you are expecting a genuine Italiano Pizza experience then this may not be the right place. However, if you are a person who wants good grub for their money then yes you are at the right place. 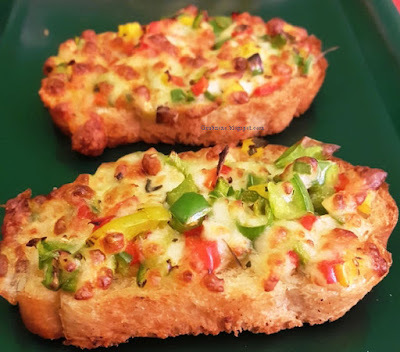 Bruschetta is far better a choice than the over used garlic breads. 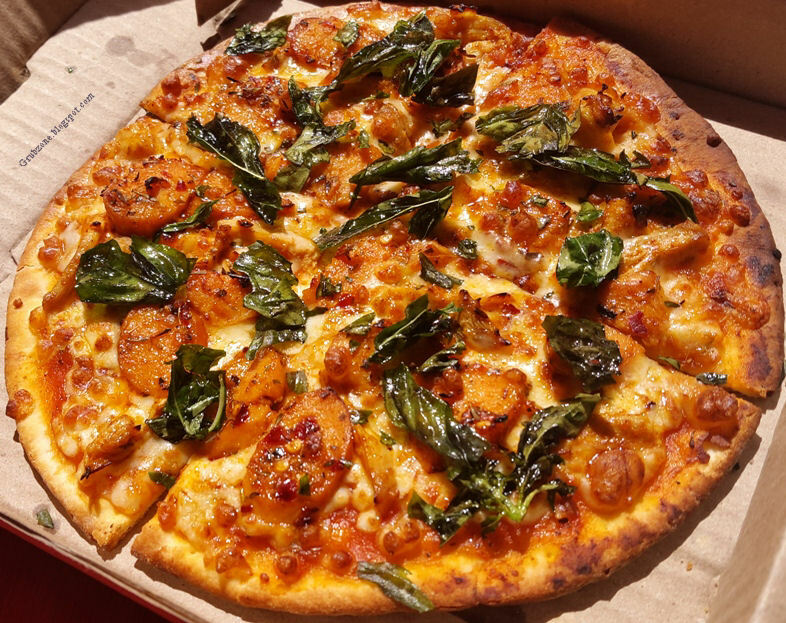 Apart from having the traditional tomato and basil mix, this variant also had Indian spices and a bit of chili. 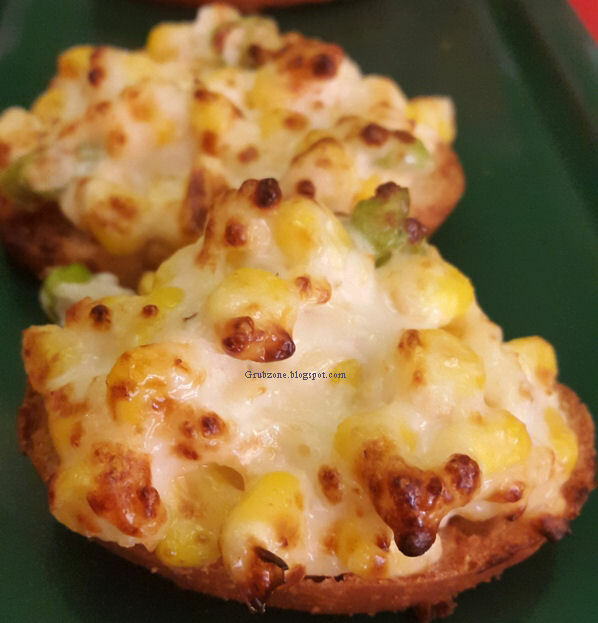 Think of it as lip smacking chatpata (Peppery spicy tangy)Bruschetta. The salty-spicy flavor will make you forget that this is but a mere appetizer. I desired more of this after I had finished it. Extra credit for creativity that worked. Captain : This be so colorful and pretty. Crewmate : Cappy, why do we always end up eating when we are in crisis? Captain : Because lad, good grub helps ya think properly. And ya need a good head to steer through a crisis. Crostini is a sibling of Bruschetta with almost unnoticeable differences to the later. Its more cheesy and crunchier in laymen terms. This variant had a subtle sweet flavor within the cheesy matrix. It was due to the presence of American corn inside the cheese blanket. A fun eat and a nice side with the pizzas. BBQ Chicken Pizza was the real deal. Unlike the variants offered at other delivery chains, this avatar actually had the sweet BBQ sauce on it. The thin freshly made crust topped with generous amounts of chicken and cheese with BBQ sauce was quite a surprise from a place that does not specialize in Gourmet pizzas. Its a real shame that they don't have a delivery outlet in my neighborhood. Captain : Hot dayumn, I love BBQ. Crewmate : Why are you sounding like a cowboy Cappy, bored with the nautical lingo already? Captain : Son, my words change with what I eat. Crewmate : We better get ya back to Rum and squid then. Chicken and Basil Pizza was a pretty looking thingy. The chicken over here was more on the saltier side and the Basil leaves were fried to a crisp. This reduced the flavor of the leaves but added a crunchy overtone to the pizza. This pizza also had a divine aroma. It was almost a gourmet pizza. Crewmate : I have a feeling that we are being watched. Captain : Ya, its one of those scoundrels from earlier. Crewmate : Should we beat the barnacles out of him? The place usually has self service or you may get served by one of the delivery blokes. 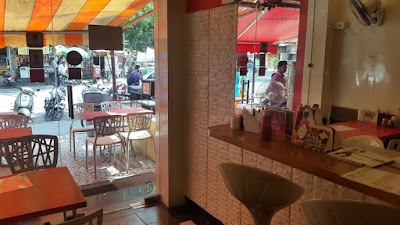 The place specializes more on home delivery but one can still get a good afternoon or evening experience over good pizza. The Pricing seems to be at par with other delivery chains like Smokin Joes, Eagle boys or Garcias. 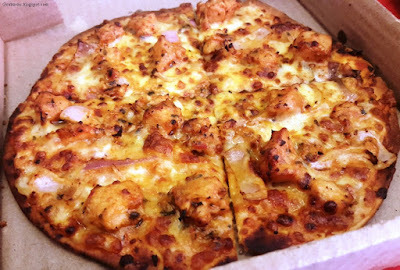 It however is much cheaper than Pizza hut and its quality exceeds that of Indian Pizza hut pizzas. I usually avoid cross town trips to small outlets as they often are not worth the time. But this place has all the makings of a local legend to it. If they keep the quality consistent over time, it is likely that this little business will grow and grow greatly. So pizza lovers, if you are around the airport or in Vile parle east - Pizza Box can be a pleasant off the mainstream experience for ya. Captain : (Drops a piece of crumpled paper) Aight mate lets head back. Spying Scoundrel (quietly picks up the piece of paper after the Captain leaves) : Wonder what this be? Maybe a clue to where those losers are sailing to next... Hey, what is this? A Bill? Restaurant Server : Oh, so you are paying for those two? Spying Scoundrel : Wait no. I...I. Restaurant Server : They said that you will pay and you picked up their tab, literally. Now pay up or you are doing dishes for a month. Spying Scoundrel : Arrrr, those losers, they will pay for this. Restaurant Server : Stop ranting and NO, you will pay for this. The article was very good and nice to read. Thank you for this interesting atikel .